Trim the apple & blend all the ingredients. 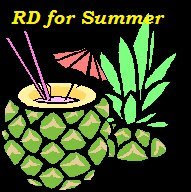 I am sending this to RD for summer Hosted by Anu Sriram. 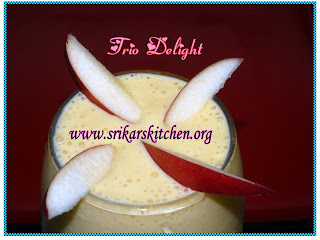 Trio delight looks droolyfying ...How r u ? Thats a delicious combo...looks gorgeous! wow now thats one perfect combo Priya.....will try it soon. Trio delight! As the name says, the recipe is a true delight! Looks delicious! Thanks for sending it to my event..
Trio delight looks simply great .. Thanks a lot for ur comments in my blog dear ..
Trio looks yummy and delicious. Love the addition of mango icecream. wooooooooooow thats looks like a amazing drink for summer delicious perfect entry. Great for the summer drink! let me call it a fruity delight :) yummmm and refreshing! Wah!..A drink with icecream..I could imagine how creamy and rich the drink must be! I can imagine how delightful this combo would be. Wow, that sure sounds like a delight! great entry! I'm waitin for summer now. :) Waah mango ice cream What a combination! Thanks for visiting my blog, Trio Delight, looks co0o0ll, shall surely try it.